On March 19th, West Seattle High School hosted an IGNITE Panel presentation! We had 64 engaged young women eager to learn more about careers in STEM (science, technology, engineering and mathematics). The Panel was made up of three diverse women who held varying positions in STEM at Nordstrom, Microsoft and Amazon. The women spoke about their career paths, and what it’s like being a woman in a male-dominated field. Their stories were compelling and very eye-opening for the students! The response was overwhelming! All of the students were interested in IGNITE after the Panel, and they even started a plan to develop a STEM Careers club at school to keep the energy high. Thanks to IGNITE and to the PTSA  for funding pizza and snacks for the event. 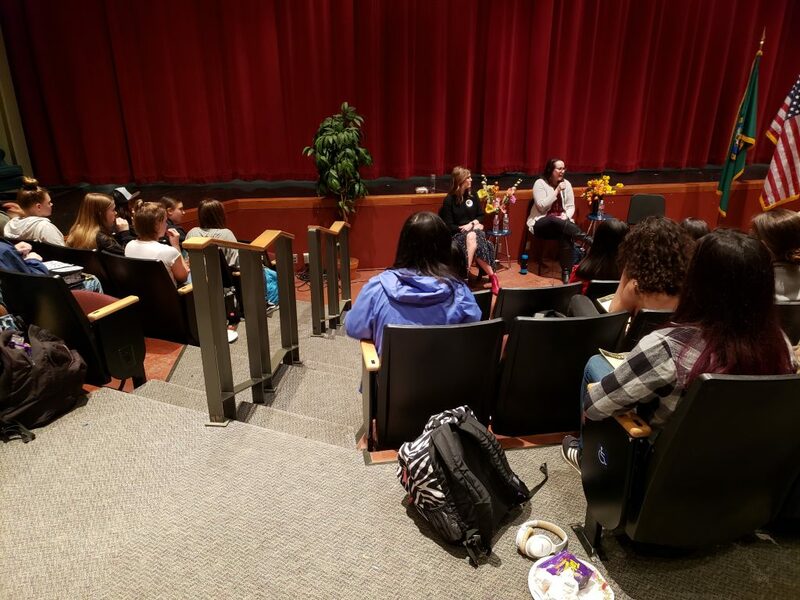 Thank you to the three IGNITE speakers who shared their experiences with the girls at West Seattle High School! "I loved that I could hear these stories of amazing women and then have my questions answered." "My highlight was hearing each woman's backstory on their careers and what it's like being a woman in a male dominated field." "When they talked about how going to college and not knowing what you want is okay." "The honesty in the room and the insights that were given for being a woman in the workplace." "I liked hearing about struggles that these women overcame and how they all grew from problems." "I enjoyed hearing their background stories and how they got to where they are. I was inspired by the abilities of the women." "It helped me realize that there are many allies that are women in this industry." "I liked how each woman had a different story of how they got into the STEM program." "I liked learning about how we need more women in STEM. This made me interested because it made me think about how us women need to rise up and not let all the men have the glory." "That woman have the power and should have a voice, and have confidence. And it's giving me strength and I am proud to be a woman." "I enjoyed the variance of jobs that the women had and how they each told their unique stories."